With two daughters to buy gifts for this xmas, I thought I would share some ideas for girls. 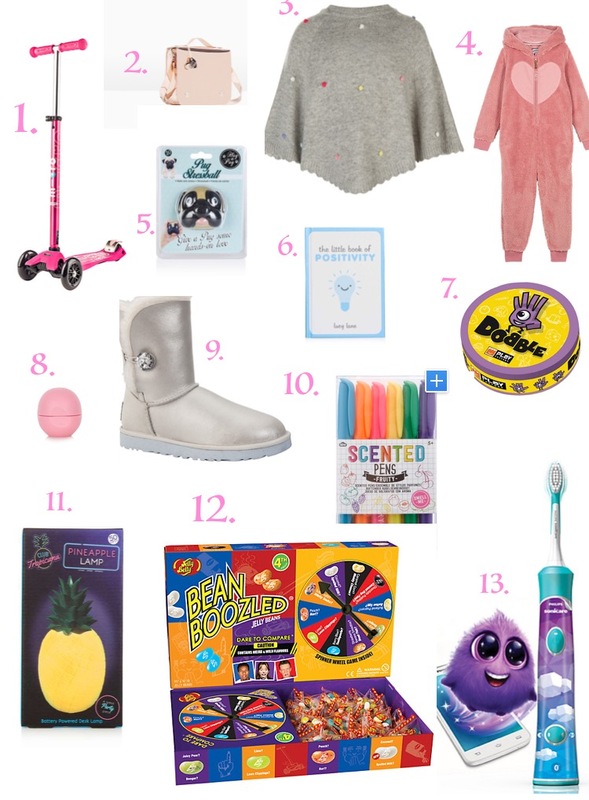 This list is probably geared towards my two, who are aged 9 and 11, but hopefully there might be one or two things that are appropriate for all aged girls. Micro Maxi Scooter – new weight limit of 70kgs, this scooter will allow your child to grow. They are 100% worth their price tag. My lot have had these scooters and they are safe, robust and extremely useful if you have a walk to school or to clubs. Pink Mirror Bag from Zara – my girls are at an age where they want to carry their own money and purses (and lip salve!) and this bag is so gorgeous. Milla has it and always has people asking her where she got it from. Angel Poncho from Accessorize – This is currently in the sale and I thought it would be so useful in the winter. Fat Face Deer Onesie – My two live in their onesies. They come home from school and change into them straight away in winter. Pug Stress Ball – My eldest has very important exams coming up and has requested a stress ball! I found this one in Topshop and she loves dogs! I thought it was too cute not to share. Little Book of Positivity – You can never start too young with messages of positivity! Dobble Card Game – My two are obsessed with Dobble and it’s a really great game for the holidays. EOS Strawberry Lipbalm – Another obsession! But I have to say, it is VERY good stuff! Silver Ugg Boots – I think Uggs are perfect for kids. They are warm, comfortable and very easy to get on and off, plus these would go with everything. Scented Pens – I think all girls are mad about stationery and who doesn’t love a scented pen?! Pineapple Light – the perfect little night light, for £10! Bean Boozled – This is such a fun game that the whole family can play. AND it involves sweets. Win Win! Sonicare Toothbrush for Kids – This toothbrush connects to an app which helps children to brush their teeth better and for longer. Probably a novelty that would wear off after a while, but I am a firm believer in electric toothbrushes. So there we go, a few ideas to get you thinking… Xmas is creeping up on us and I really need to start shopping from my own lists soon! I am a fashion loving mum of three, blogging about my love for clothes, interiors, children's fashion, fitness, beauty and travel. I live in London with my husband, three children (Liv, Milla and Charlie) and our siamese cat called Sammy.